Ami’s Flatter and Luis Contreras. Burns photo. 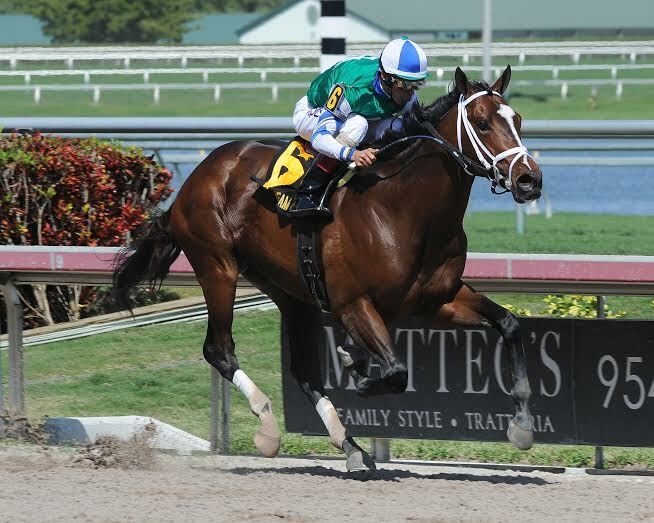 #1 Ami’s Flatter (8-1): If you’re looking for a price alternative to the favorites–and there aren’t too many here–then this is your guy as he added blinkers and Lasix and was a fine second to hotshot Carpe Diem in the GII Tampa Bay Derby three weeks ago. And sure, it had a “someone had to be second” feel to it, but it was no doubt a breakthrough effort for a son of Flatter that was thought of as nothing more than a second tier 3-year-old before that run. 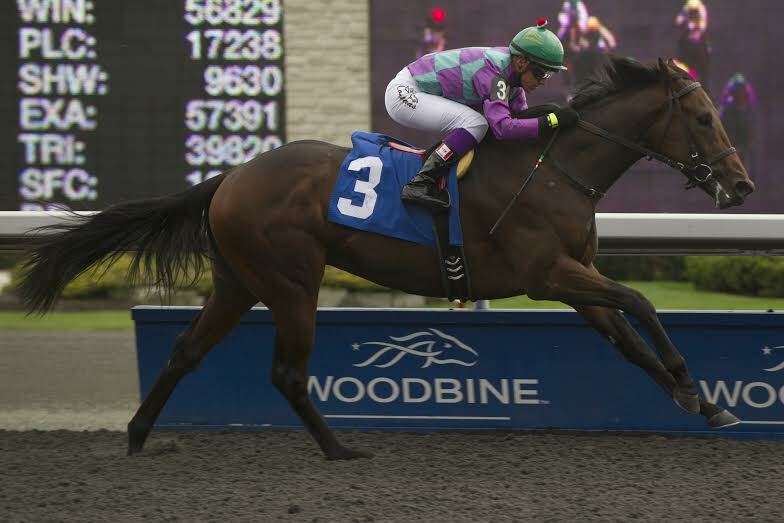 And if you’re unfamiliar with Carroll, she did a heck of a job campaigning Careless Jewel to some mighty big 3-year-old filly wins a few years back, so she knows what to do with a nice horse. The big guns are no doubt talented, but aside from the top two, who in here is he really supposed to be scared of? Thinking he outruns his odds. #2 Jack Tripp (20-1): Huge longshot will get a few dollars from first-time gelding fans, but other than that, he’s got little to nothing going for him. Romans has blown up the board in this race in the past (Shackleford was a heartbreaking second at 68-1 in this race a few years ago), and this son of Flatter probably makes the lead, but he’s 0-for-4 since a Keeneland MSW win in October, so why he would warrant a start in this, his first stakes, off a January layoff, is anyone’s guess. Respect his Eclipse Award-winning trainer, but this has “get home safely” written all over it; adds fuel to the pace. #3 Indianaughty (20-1): The second of the Romans runners disappointed mightily when he was the pick in the GIII El Camino Real at Golden Gate Fields in his last start and sure picks a mighty ambitious spot to make his dirt debut. At least his sire Indian Charlie relished the surface, so maybe he moves up over it, and aside from the big two, this isn’t your dad’s Florida Derby., either, so if he likes the surface, who knows, maybe he wakes up and runs in the number? But that’s really thinking of the best case scenario, as this seems to speak of desperation, rather than the plan all along, which rarely works out the way you want; not seeing it. #4 Itsaknockout (2-1): Extremely controversial (and we’re being kind) winner of the local prep, the GII Fountain of Youth last month, ran his record to 3-for-3 when he finished 2 3/4 lengths behind today’s rival Upstart but was awarded the W when that runner drifted out late. And sure, there was some trouble, but they could have run around seven more times and then taken it to Hallandale Beach Boulevard and he still wasn’t getting by, so he’s got a lot to prove in this spot. He’s also never run fast in his life, so with his Pletcher stablemate Materiality running a hole in the wind over the track/distance and Upstart laying over the field on class, with the figures to back it up, this son of Lemon Drop Kid is no doubt bringing a bit of a Swiss cheese resume to the table. Which means at a relatively short price (he’ll be third choice and closer to 7-2, not 2-1), having never run fast enough to win this race, much less make a serious dent, do you really want to string along and see how much more is in the tank on a runner who was going backwards entering the far turn before he found himself late in the FOY? Underneath, if at all. #5 Quimet (20-1): Zito runner was beaten about a furlong by likely favorite Materiality 22 days ago in the local Islamorada at today’s 9 furlongs and looks completely overmatched here. Fans of this Hall of Fame barn will mention all the big upsets he’s pulled in the past, one of the biggest being the Belmont a few years back with this gelding’s sire Birdstone, but it’s safe to say most, if not all, of those surprises came from runners with more than just a 50k maiden-claiming win to their credit. Tactical sort will be close early and is the only horse in the field that’s run more than one at today’s distance, but anything else but the bottom rung of the exotics seems a giant reach; tough to endorse. #6 My Point Exactly (30-1): Talk about being thrown to the wolves; this huge longshot hasn’t been out since September, when he won a minor turf stakes at Louisiana Downs, and has never been two turns on the main track, either, so wow, did Kaplan pick a mighty tough spot for this Concord Point gelding to make his sophomore debut? If you’re scouring for a positive, then he did win his only dirt start over 6 furlongs right here, by 10 1/2 lengths, too, but that was in August, when anyone with real talent was well up the map in Saratoga Springs. Lightly raced runner may have some talent and might be useful here this summer when the big guns clear out, but this just isn’t the spot for him; easy toss. #7 Materiality (7-2): Scary Pletcher newcomer aired in his stakes and two-turn debut when he drilled stablemate Stanford (who runs about 25 minutes earlier in the Louisiana Derby at Fair Grounds) over the track/distance to go 2-for-2 here and lifetime in the Islamorada and certainly rates as the “now” horse for a barn that has a few of these GP studs each winter. What that means when they leave South Florida is anyone’s guess, but today it means he’s catching a favorite who drew horrifically and may not be primed and a stablemate who has a resume that was built on non-DQ that even had Kaleem Shah shaking his head. Son of Afleet Alex is certainly on the come and seemingly gets all the best of it today, as he’s versatile enough to be on or just off the lead, get the jump on Upstart, and kick clear off the far turn, though he’ll probably be closer to 7-5 than this laughable ML; doubt they beat him, today. #8 Dekabrist (30-1): The longest shot in the field is also the most experienced, with 13 career starts, but that’s not going to matter all that much when the gates are sprung, as he’s eons behind these in talent and dirt form. Well-bred son of Street Boss woke up on the turf last time for Dorochenko, when he was a good fourth in the Black Gold at Fair Grounds, so why he’s here and back on the main track is anyone’s guess. This barn has a “wants to be part of the party” mentality and that might get them a tan in sunny South Florida, but it won’t pick them up a check in this type of spot as he’s been beaten 88 1/4 lengths in his six dirt starts this year; here’s hoping the sun is shining. #9 Upstart (8-5): Aforementioned unlucky FOY “loser” will have his work cut out for him today from just a brutal post, as he’s going to be wide, wider and widest from simply an unfair draw. Of course, when you’re the best horse in the race and own a resume that lays over this field, all is not lost, and anyone who saw his pace-pressing local win in the GII Holy Bull knows that he’s plenty tactical to work out a trip. It’s also worth noting that he likely got the dreaded bounce out of the way last time, since he freaked in the Holy Bull and regressed some in the FOY; of course, to play devil’s advocate, you can’t think Violette has the screws on this NYB son of Flatter fully cranked with the Derby in mind five weeks hence. Not to mention that he draws poorly over a track/distance winner who is trained by a conditioner who seems to work head-scratching wonders with his 3-year-olds over this strip; second-best, for today. Agree that the race belongs to those four. I think Upstart on top of the other three in tris and supers, and Materiality over Upstart over the other two in tris and supers is the way to play it. Thanks Mike and good luck. If the post was better I think Upstart would be a cinch, but that is such a huge disadvantage that it could prove costly. Plus Materiality needs the race for points, whereas Upstart doesn’t.